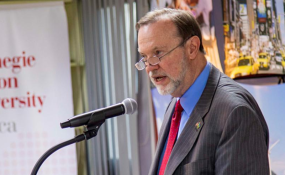 Tibor Nagy, United States Assistant Secretary for the Bureau of African Affairs, delivers his keynote address at Carnegie Mellon University yesterday. Accra, Ghana — The tensions in Cameroon's anglophone regions have taken a clear toll on the country's unity. Anglophone and francophone Cameroonians, who have lived as friends and neighbours for decades, are deeply - and increasingly - divided on fundamental questions of democracy and state legitimacy, an analysis of 2018 Afrobarometer survey data shows. Major divisions have emerged as many anglophone Cameroonians have abandoned their support for and belief in the durability of Cameroonian democracy, as well as their fundamental trust in the state. - Only one in eight anglophone Cameroonians (12%) see their country as "a democracy with minor problems" or "a full democracy," down from 52% in 2015. Francophone citizens are almost four times as likely (45%) to say they live in a functioning democracy. - The proportion of anglophone Cameroonians who are at least "fairly satisfied" with the way their democracy is working has dropped from 43% in 2015 to 7% - less than one-fourth the share of francophones who express satisfaction (33%). - Eight out of 10 anglophone respondents (81%) say people have less freedom than "a few years ago" to say what they think about politics, compared to 22% of their francophone counterparts. - Anglophone citizens are more than twice as likely as francophones to say they fear political intimidation or violence, 46% vs. 20%. - Fewer than half (45%) of anglophone Cameroonians now prefer democracy to any other political system, down from 64% in 2015. Among francophones, support for democracy has remained at two-thirds (66%). Support for elections shows a similar pattern. - About six in 10 anglophone citizens say they do not trust the police (58%) and the army (62%) "at all," compared to 24% and 13%, respectively, of francophones. Distrust in the security forces has increased sharply among anglophones since 2015. - The proportion of anglophone respondents who identify more strongly with their ethnic group than their nationality has quadrupled since 2015, to almost one-third (31%), compared to 13% among francophones. Afrobarometer is a pan-African, non-partisan research network that conducts public attitude surveys on democracy, governance, economic conditions, and related issues in Africa. Six rounds of surveys were conducted in up to 37 Africans countries between 1999 and 2015, and Round 7 surveys were completed in 2018. Afrobarometer conducts face-to-face interviews in the language of the respondent's choice with nationally representative samples. The Afrobarometer team in Cameroon interviewed 1,200 adult Cameroonians in May-June 2018. A sample of this size yields country-level results with a margin of error of +/-3 percentage points at a 95% confidence level. Previous surveys have been conducted in Cameroon in 2013 and 2015. For more information, please see www.afrobarometer.org.